The fall season has arrived in the Northern Hemisphere, and even the Sun is getting into the Halloween spirit as evidenced in this “jack-o’-lantern” image captured recently by NASA’s Solar Dynamics Observatory. But before you go out trick-or-treating, we’ve got a number of stories to captivate your curiousity. We highlight the 10th anniversary of SpaceShipOne rocketing into space and claiming the Ansari X Prize. We give you the scoop on Spaceport America in New Mexico, from where Virgin Galactic’s SpaceShipTwo may soon be launching commercial passengers on trips to space. We tell you all about the Deep Space Network here on Earth that allows us to communicate with the many spacecraft exploring the solar system. And we’ve got an interview with Charley Kohlhase who was instrumental in the development of many of those planetary probes. We’ve also loaded this issue of RocketSTEM with articles about Orion’s upcoming launch, the Student Spaceflight Experiments Program, the arrival of two new orbiters at Mars, Rosetta’s succesful journey to a comet, a decision made on NASA’s commercial crew program, a beginner’s guide to planetary photography, and more. 02 Deep Space Network For five decades, the DSN has enabled us to stay in touch with our interplanetary craft. 10 Charley Kohlhase Exploring the solar system has been a lifelong passion for this rocket scientist. 22 Planetary Imaging The first chapter of our guide on how to go about taking your own planetary photos. 26 Rosetta Next month the ESA mission will make history by landing successfully on a comet. 38 Spaceport America Far away from the Florida coastline, a new spaceport has risen in the desert. 58 Orion EFT-1 The initial test flight of NASA’s first new manned spacecraft since 1981 is nearly upon us. Once again we are pleased to announce that a limited number of high-quality printed copies are available for this issue. If interested, please visit www.rocketstem.org/purchase. While there, also consider signing up to be notified should we begin offering an annual print subscription for the 2015 calendar year. 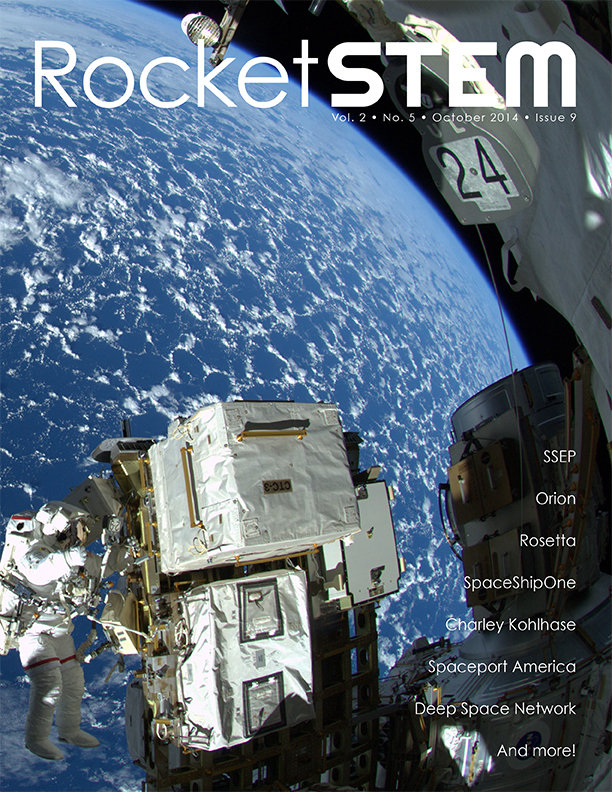 Since founding RocketSTEM two years ago, we’ve stated that each issue of the magazine will be FREE to read online. As a non-profit organization that is a mission we intend to never stray from, however, that is not to say that funding such a publication is not costly. If you would like to help us continue our mission, please consider making a donation to RocketSTEM via our website at www.rocketstem.org/donate.